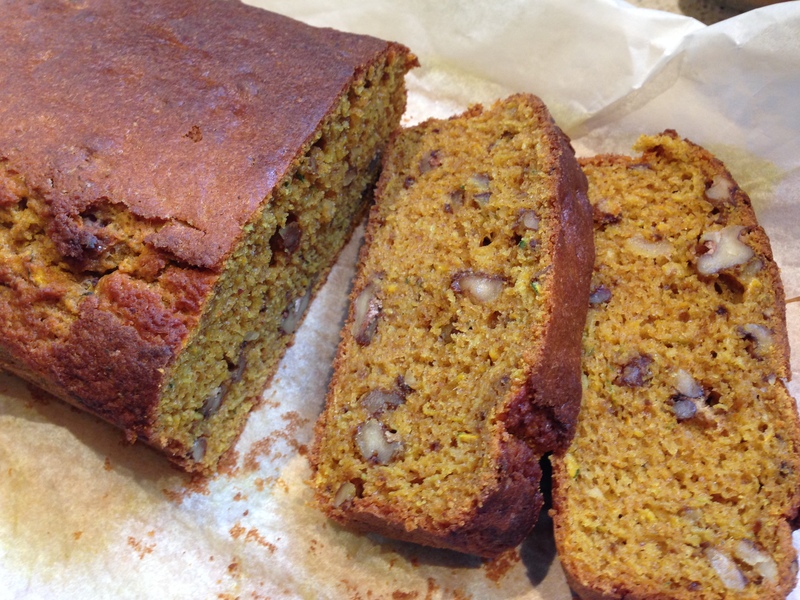 I should have titled this post The Great Zucchini Loaf Challenge! I have a friend who is always telling me that they positively hate zucchini. This friend last ate zucchini thirty years ago at boarding school. They tell me often that it is a waste of a vegetable, that it tastes like soggy watery nothing and that no-one in their right mind should enjoy it. Boarding school ruined many culinary experiences for my very food-unadventurous friend. However, I have witnessed this same friend gorging on stuffed deep-fried zucchini flowers with no idea what they were eating! They maintain that they positively hate beetroot but once gobbled down almost an entire chocolate beetroot cake I’d made. When I explained that beetroot was the main ingredient they just shrugged their shoulders and smiled as they stuffed the last crumbs into their mouth. 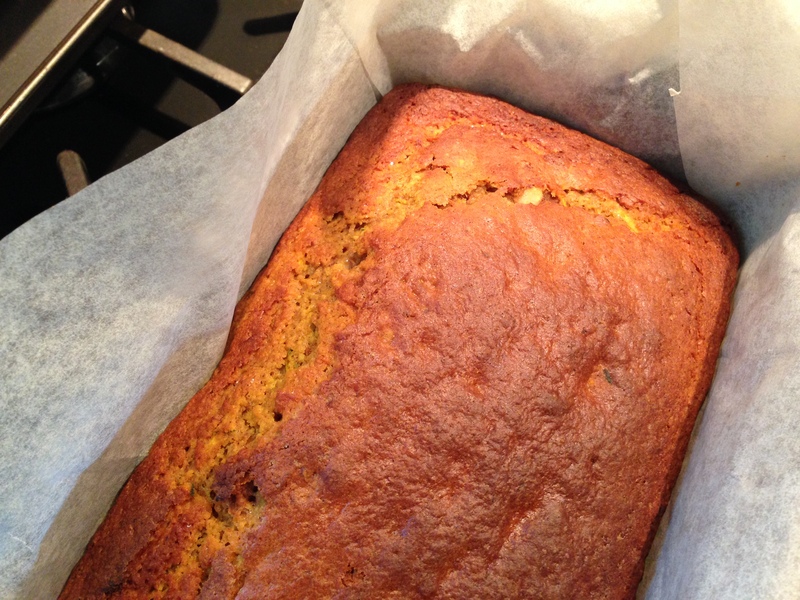 I knew they’d eat zucchini in a cake, so I decided to bake some zucchini bread to prove my point. But I’m back on my Lyme drugs, and following a fairly strict diet. It seemed so unfair that I would make a delicious cake that I then couldn’t eat! So I have modified the ingredients so that this cake is healthy, delicious and suitable for people like me who are on restricted diets. Let me assure you that the modifications in no way limited the yumminess. Some people don’t like the taste of gluten-free flours, but the spices and flavourings I’ve added totally mask them. This cake is moist, flavoursome, full of nutritional value and so scrummy that people who cringe at the words ‘gluten-free’, let alone ‘sugar-free’, shall chomp it all up in happy oblivion. As predicted, my zucchini-loathing friend adored this recipe and even asked if I could make it for them again once they knew what was in it! 1 cup of plain gluten-free flour mix, 1/2 cup of almond meal, 3 teaspoons of baking powder (I use Wards, which is gluten-free),1 cup of grated raw zucchini, 1/2 cup of finely chopped walnuts, finely grated zest of one lime and 1 tablespoon of lime juice (a lemon can be substituted), 3 heaped tablespoons of Natvia or your favourite sugar substitute (if you are happy to use sugar use 2/3 to 1 cup of raw sugar – to your taste), 2 large eggs (vegans – use your favourite egg substitute or 1/2 cup of mashed banana), 1/3 cup of oil of your choice (olive, coconut, rice-bran, vegetable etc), 1/4 cup of coconut milk (or soy, almond etc), pinch of good quality salt (I like pink Himalayan), 1 heaped teaspoon of cinnamon, 1 heaped teaspoon of turmeric powder, 1 level teaspoon of ginger powder, 1 teaspoon of vanilla extract or paste. Notes: If you need this recipe to be tree-nut free just use more gluten-free flour instead of the almond meal, and omit the walnuts. A nice variation would be to replace the walnuts with finely chopped dried apricots. The lime tang is quite prominent in this recipe. If you don’t like a citrus flavour swap the lime or lemon out and use an extra tablespoon of coconut (or your favourite) milk. You can also make this recipe with conventional wheat flour if you prefer. Preheat your oven to moderate (160 degree celcius fan-forced or 180 degree oven – 350 degrees fahrenheit). 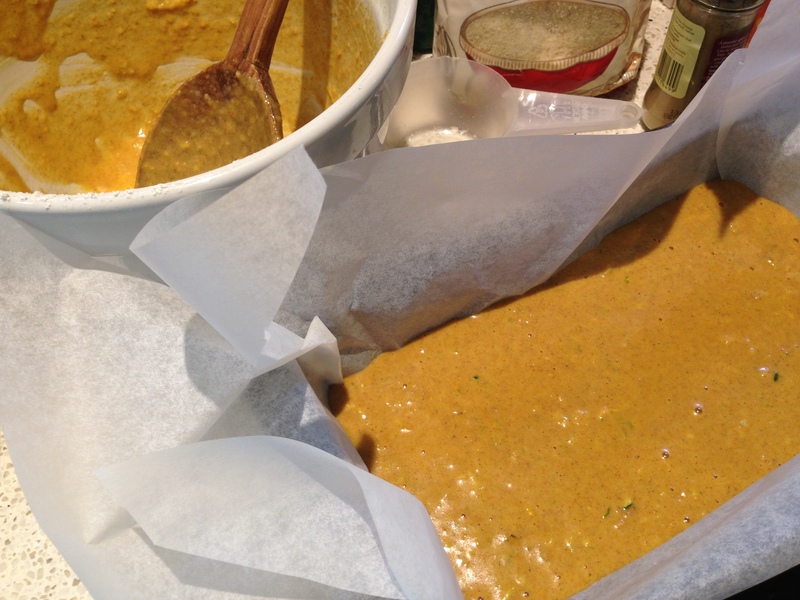 Line a loaf tin (23cm x 12cm – 9 inch x 5 inch) with baking paper. 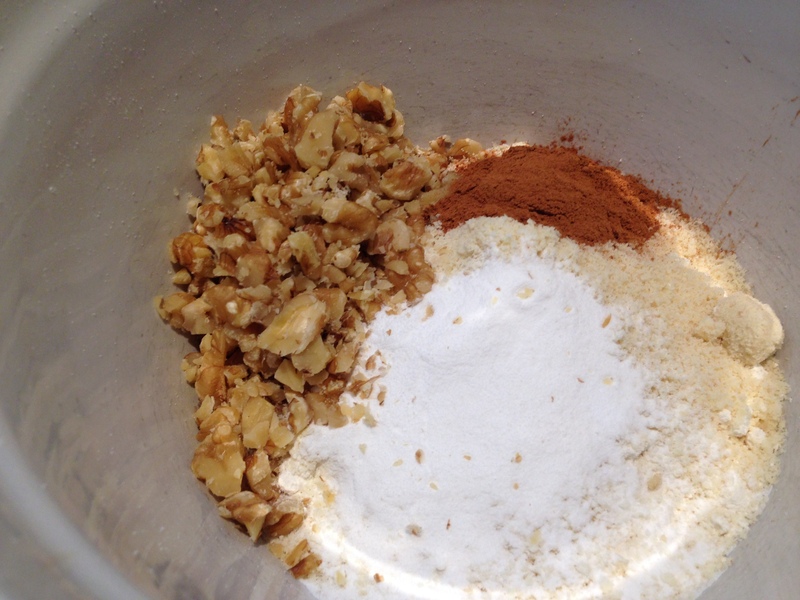 Place the flour, baking powder, almond meal, walnuts and spices in a large bowl and mix well to combine. 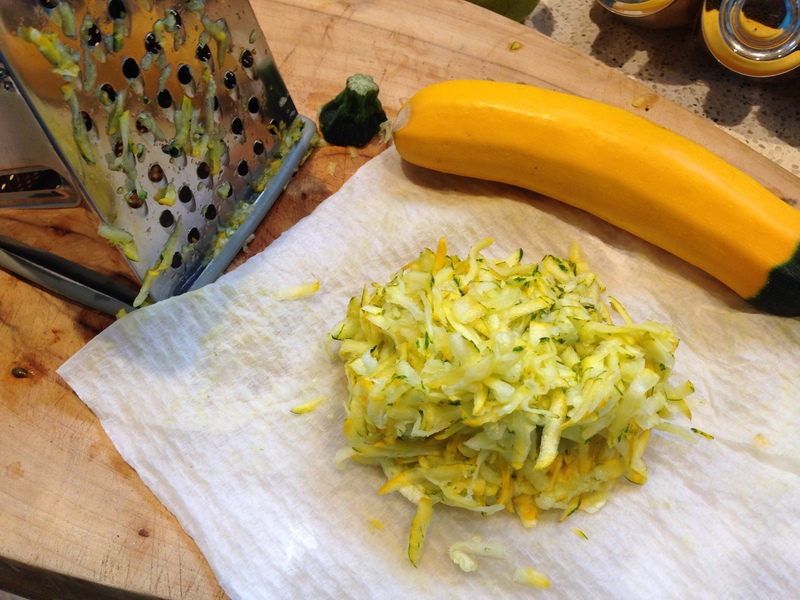 Put the grated zucchini in some paper kitchen towel and gently press the liquid out of it, then place it into another large bowl. Add the natvia or sugar, the two eggs, the oil, vanilla, lime zest and juice, and the coconut (or other) milk. Stir until well combined. Now add the wet mix to the dry mixture and stir well to combine. The mixture will look quite wet. Don’t panic. 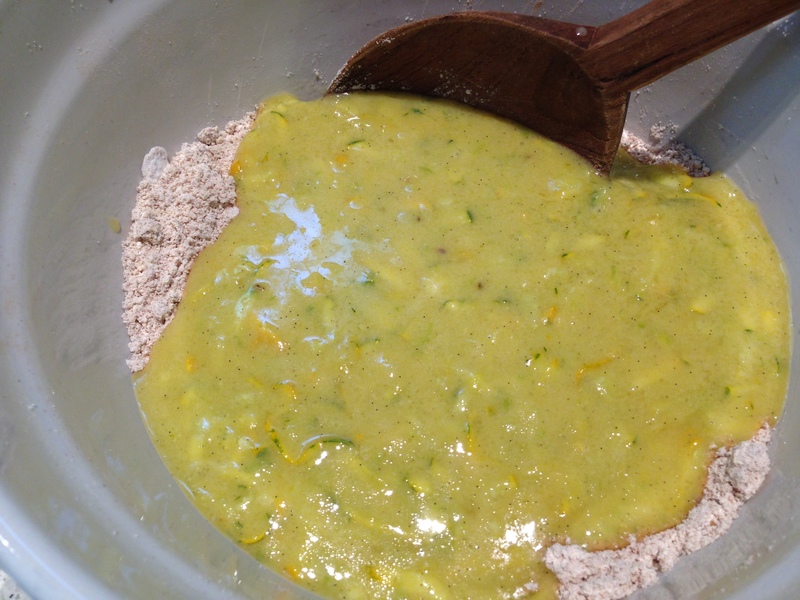 The picture below shows my wet mix BEFORE I added turmeric, which was a last-minute flash of inspiration. Bake for 35 to 40 minutes, or until the cake springs back lightly when pressed in the centre, and a skewer inserted in cake comes out clean. Cool in tin for five minutes, and then turn out onto a wire rack to cool fully. Serve with a mug of your favourite beverage. The bread will keep for about a week (if it lasts that long) and toasts well after it is a day old. This entry was posted in Cakes and desserts, Gluten-free, Lyme Disease, Vegetarian/Vegan and tagged dairy free dessert recipe, dairy free zucchini bread, diabetic cake recipe, gluten free zucchini bread, sugar free zucchini bread, sugar-free baking recipe, vegan zucchini bread, zucchini bread, zucchini cake, zucchini recipe by Cauldrons and Cupcakes. Bookmark the permalink. nom nom yum yum I want some in my lunchbox Mum! You are a brilliant genius!!! This recipe looks quite perfect 🙂 Thank you massively for sharing it. mmm can’t wait! our chooks have been very slack on the laying lately…i just told Mike (Hubby) i was gonna make cake, a super healthy one, he said NO we can’t waste our eggs on a cake!! might have to wait a bit…c’mon chooks, lay!